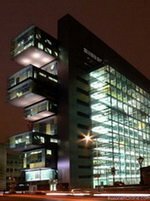 Architectural glass types stem from major advancements in glass production technology which gives the architects and designers the opportunity to vary the appearance of the building envelop. 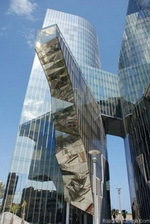 Check Innovative Structural Glass for design options, and Center for Window & Cladding Technology for more info. In this process, flat surfaces is formed on both sides by floating a continuous molten sheet of glass on a bath of molten tin. The temperature is high enough to allow the surface imperfections to be removed by fluid flow of glass. The temperature is gradually lowered as the glass moves along the tin bath and it passes through a long annealing oven at the end. Glass association of North America is also a good source for further details on specs and glass technology. Annealed glass which has been reheated to a temperature near its softening point and forced to cool rapidly under carefully controlled conditions is described as "heat-treated" glass. Very often stresses are introduced intentionally in glass to impart strength to it. The objective is to introduce a surface compression because glass always breaks as a result of tensile stresses that generally originate across very small surface scratches. Compression on the surface increases the amount of tensile stresses that can be endured before breakage occurs. Heat-treated architecural glasses are classified as either "fully tempered" or "heat strengthened" according to the magnitude of compressive stresses induced during heat treatment. The characteristic feature of tempered glass is that the glass fractures into small harmless pieces reducing the likelihood of injury to people. They are used mainly for: skylights, overhead glazing, sloped glazing, and other safety glazing applications. Units are made by bonding together two or more lights of glass with an elastomeric interlayer. The interlayer is commonly a plastic film of 0.76mm thick. The laminated architectural glass unit can be made either with annealed, heat-strengthened, or fully tempered glass sheets in any combination. The interlayer does not posses the strength or stiffness necessary to render the composite unit as strong as an equivalent monolithic light of the same thickness. The strength of a laminated unit is taken as 60 percent of the monolithic light of equal thickness. Consists of two lights of monolithic glass separated by a spacer and sealed around the perimeter. The sealed air space, act as a layer of insulation greatly improving the heat resisting properties of the unit. The edge seal may be fused glass or may be composed of elastomeric sealants and silicones capable of providing a moisture seal around the air space for the normal life of a building. The spacer contains a desiccant to absorb any moisture that may cause the fogging of the glass. Because the air space within an insulating unit is sealed, any pressure applied onto one face of the facade is effectively transferred to the other light, making the two lights share the external pressure. Made by introducing wire mesh into the molten glass before it passes through the rollers. It is used to prevent glass from shattering if it is struck accidentally. The presence of the mesh does not increase the resistance of the light to breakage, it simply holds the pieces together should breakage occur. Building codes commonly consider the strength of wired glass as 50 percent the strength of an annealed monolithic light of the thickness. Instead of casting a wire mesh within the architectural glass light, an elastomeric film can be applied to the surface to improve the resistance to falling from the frame after breakage.